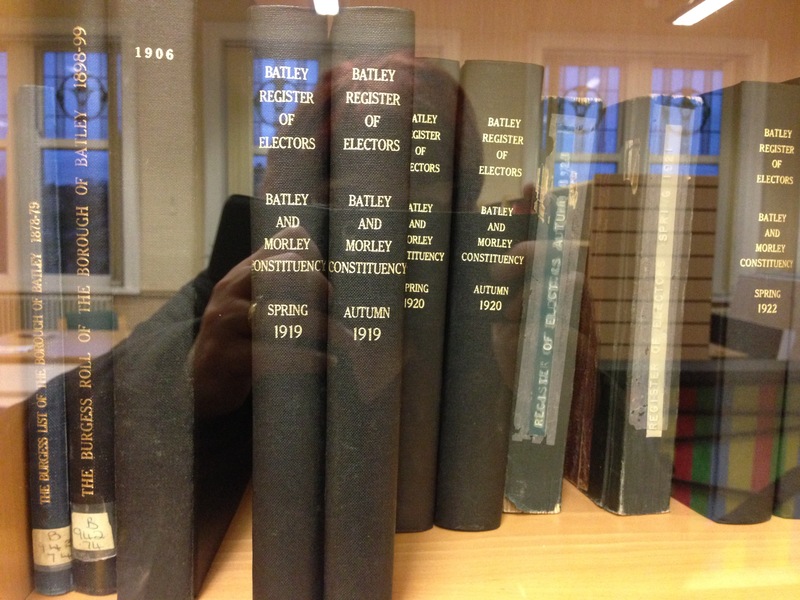 Thanks to the wonderful Batley Library staff and volunteers, the missing Batley Borough 1918 Electoral Register was located just before Christmas. 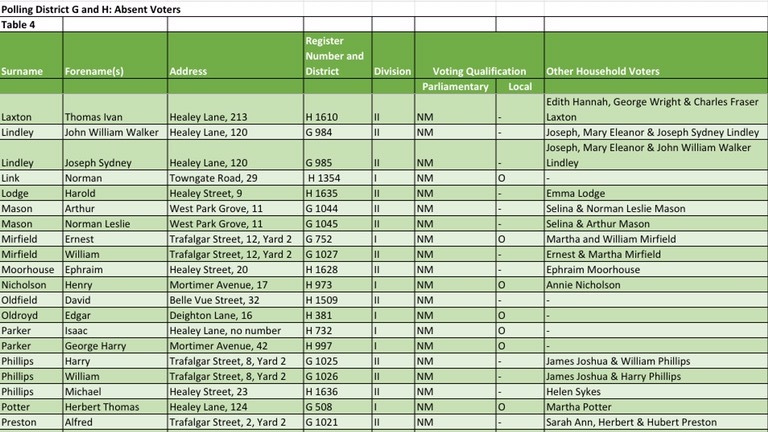 I spent the early few days of February beavering away on it to extract the absent Healey naval and military voters, and put them into spreadsheet format. This work has significantly expanded the list of servicemen I initially identified using CWGC records of those who died, the WO 363 “Burnt Records” and WO 364 records of those discharged for medical/capability reasons. This initial list identified 39 men, though I have subsequently discovered an additional man. He is Arthur Ellis, a rag merchant whose address was 263 Healey Lane. He served with the Grenadier Guards, Service Number 27774. 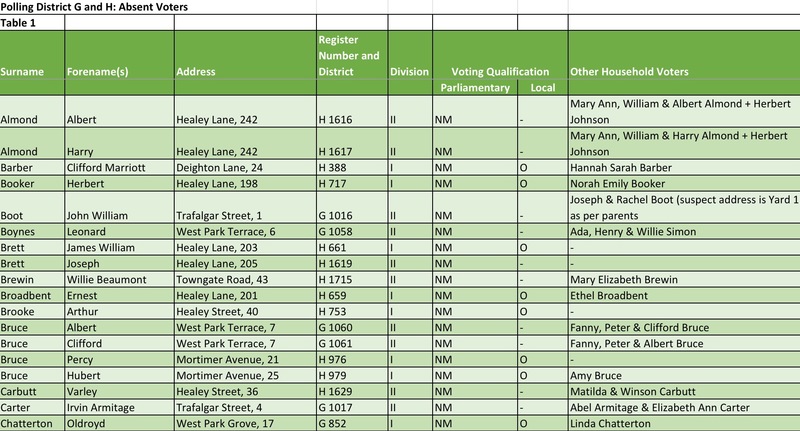 The Electoral Register, signed off on 1 October 1918 by the Batley Town Clerk’s Office, identified 121 men, though there is a small overlap with my earlier findings. 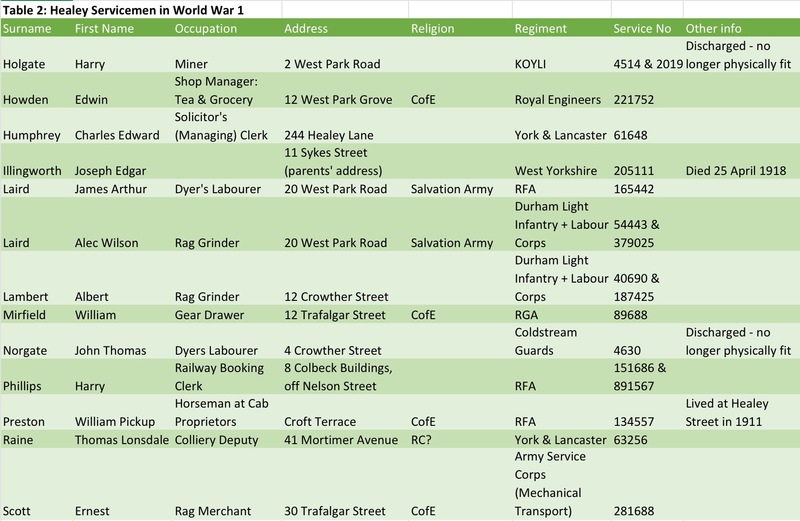 The numerical difference is indicative of the limited numbers of soldiers’ service records surviving, with around two thirds of them being totally lost or irretrievably damaged during WW2 1940 bombing. First bit of background information about voting entitlement and the Electoral Register. The Representation of the People Act 1918 came into force in time for the December 1918 general election. One of the drivers for electoral reform included the fact only men who had been resident in the country for 12 months prior to a general election were entitled to vote. This residential qualification, combined with the property ones, meant many serving King and Country overseas were effectively disenfranchised. The Act abolished these restrictions and extended the vote to all men over the age of 21. Additionally, men who had served in the war could vote from the age of 19. However Conscientious Objectors were disenfranchised for five years. The Act also gave the vote to women over the age of 30 who met a property qualification, wives who were over 30 of all husbands who were entitled to vote in local government elections and also to those who were university graduates. However, it should be noted that parliamentary and local government franchises were not the same. Hence the 1918 register is split into three categories. Division III: Persons qualified as local government electors but not as parliamentary electors. 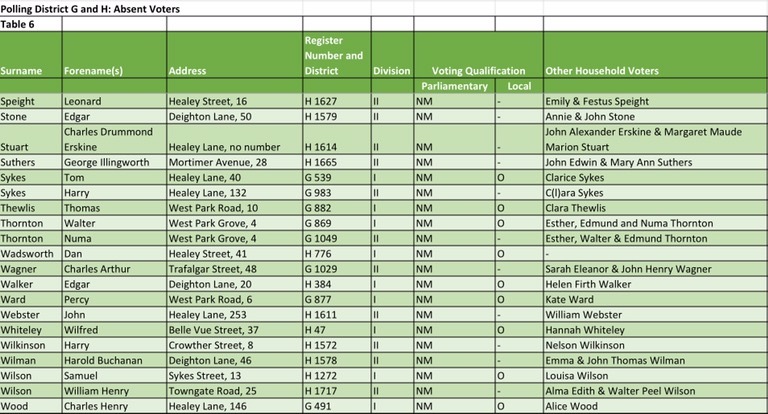 So here are the names of those identified from the 1918 Electoral Register. The men on my Healey list all fall within both the absent and Naval and Military categories. The information was supplied by next of kin so may not be accurate. It may include men who were killed after its compilation. And addresses may not necessarily reflect actual residence, but merely be the most convenient address, for example the in-laws where the man’s wife was living whilst he was serving, or a friend’s home. 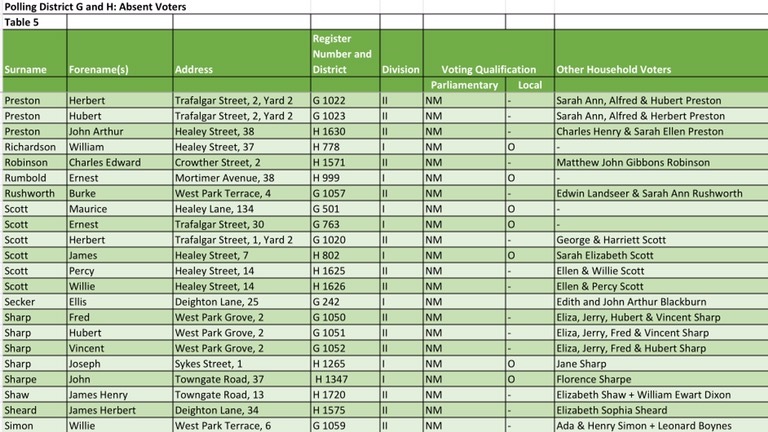 It is also worth emphasising this is the Electoral Register. It isn’t what is commonly known as the Absent Voters List (AVL). 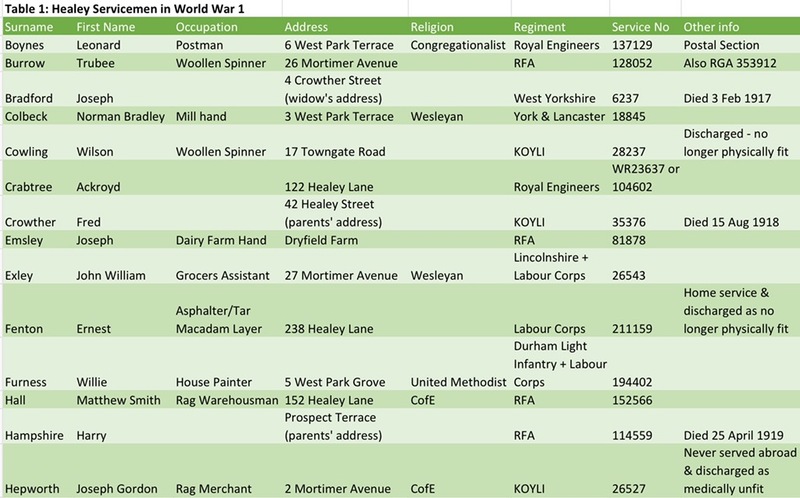 These lists, generated to provide servicemen and nurses with voting cards, ballot papers or proxy voting forms depending on where they were serving, gave far more detail. They normally included regiment, number, rank and home address. 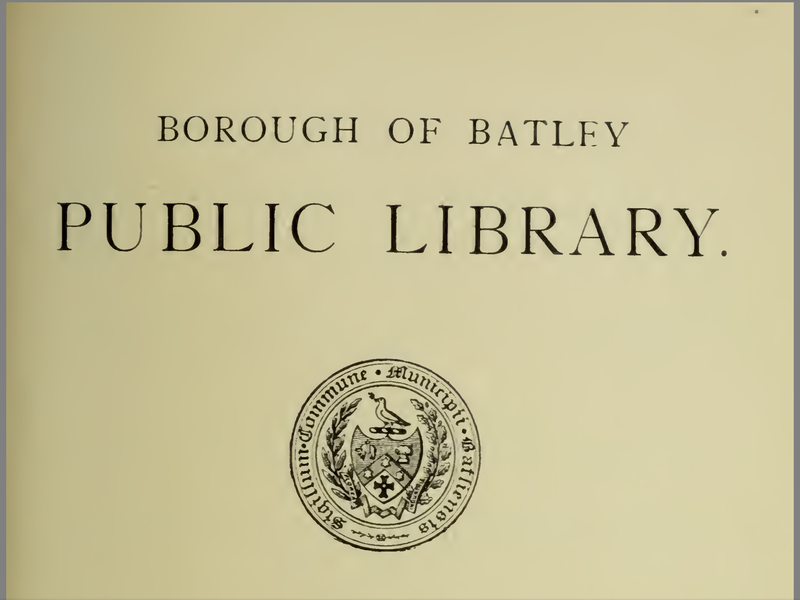 Sadly, despite checking with West Yorkshire Archives and Huddersfield Local Studies Library, I’ve been unable to locate the one for Batley Borough. It may be it no longer survives. The AVL would have provided so much more crucial identification information. But the Electoral Register is better than nothing. These are in addition to Nelson Street and Prospect Terrace identified from earlier research. Looking at the 1911 Census Summary Books some Chaster Street houses may also fall within the catchment area. 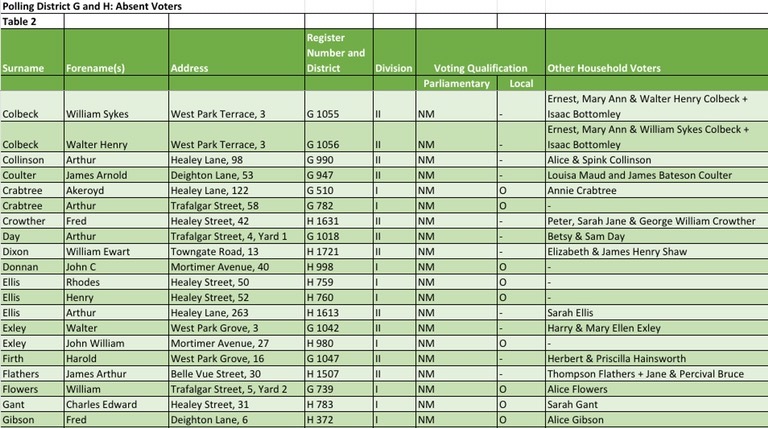 The men’s details from the Electoral Register are contained in the following six tables. 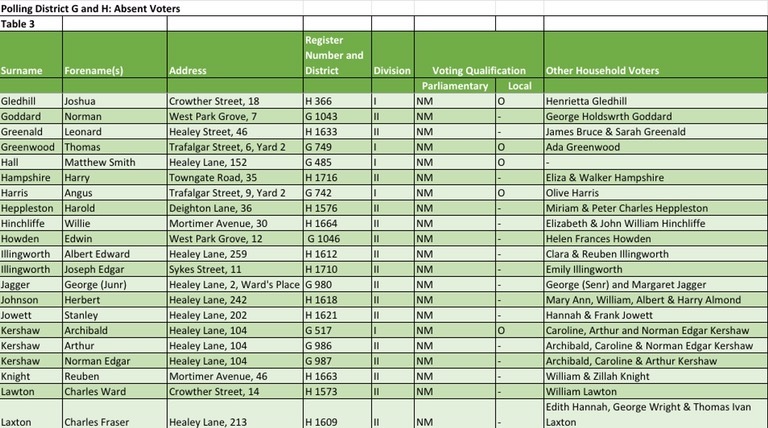 I checked across all three Divisions to identify other voters registered at the men’s given addresses, in the hope this provides more family clues. So I can give myself an early 2017 back pat. This data extraction was one of my 2017 New Year’s Resolutions. I’d targeted a March completion, so I’m ahead of schedule and I can now begin the hard research, although I am still toying with the idea of the newspaper trawl. I know from previous experience how much value this adds. It’s a case of whether I have the time to do it alone! When I researched the men on the War Memorial of Batley St Mary’s, one thing I quickly realised was that the names there represented but a fraction of those parishioners serving in the military. British Army statistics alone illustrate this. Roughly 8.7m men served in it at one point or another during the war. This includes Empire and Indian Army contingents. Of these about 5.7m were from the British Isles (including Ireland). From this 8.7m total, approximately 957,000 lost there lives (of which Royal Navy and RFC/RAF casualties were 39,527), and about 705,000 of these were from the British Isles. So between 11-12% of those in the British Army died, depending on whether you look at the total or narrow it to British Isles only. Whilst research often concentrates on those that died, one of the things I wanted to do was find about all those who served, whether or not they made the ultimate sacrifice. Many of the survivors were physically wounded and mentally scarred, some to a life-changing extent. I have a couple of great-uncles in those categories. Again, looking at the British Army statistics almost 2,273,000 were wounded (although this figure has an element of double-counting, in that if you were wounded twice you appeared twice in the numbers). Of those wounded 18% returned to duty but in modified roles, for example garrison or sedentary work. And 8% were invalided out altogether, no longer fit for military service. Families and communities were affected forever. For me Remembrance Sunday includes all those who served; all those affected be it killed, wounded physically or mentally, and those who returned home with no obvious lasting ill-effects but had given up part of their lives to serve. Sadly very few local memorials or records give these full community details. Locally one such record which stands out as doing this is that of Soothill. More information on this here. 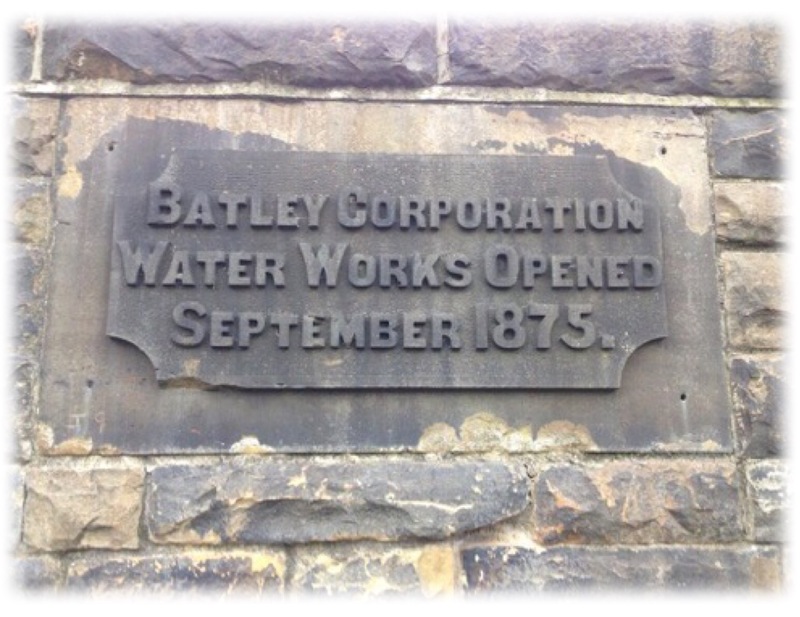 I would love to try to find out about all those from the broader Batley area, to complement this Soothill treasure. But doing this alone is impracticable. Time and record survival are the major stumbling blocks. Key to providing addresses are service records. But about two thirds of soldiers’ service records were totally lost or irretrievably damaged during WW2 1940 bombing. Those that have survived are in the National Archives WO 363 “burnt records” series. And, as mentioned, this is the overwhelmingly predominant service. 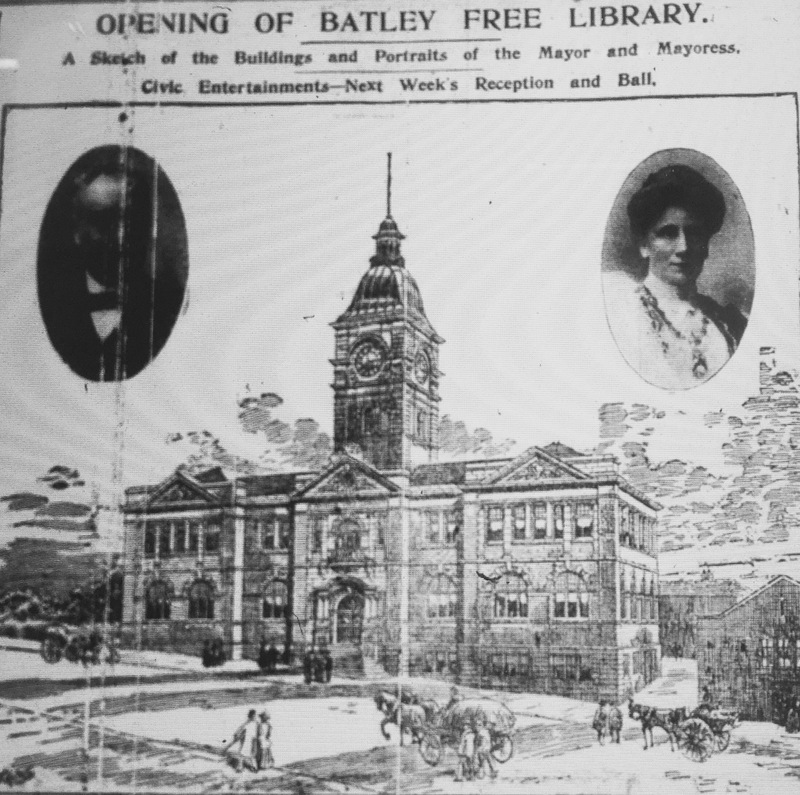 My other option was to trawl through the two Batley newspapers from the time, “The Batley News” and “The Batley Reporter & Guardian,” making a note of all mention of those from the Batley area serving in the Armed Services. I’ve made no secret about wanting to do this. 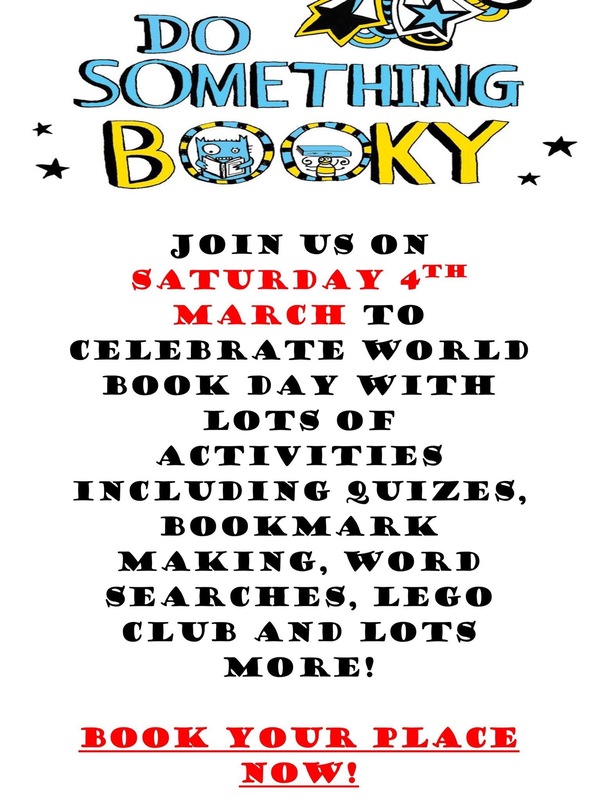 It would be a fantastic local resource. But unless I had years to spare concentrating on it, I couldn’t do it alone. The same considerations applied to Batley St Mary’s, with the added factor of connecting random names and addresses in Batley with a specific Catholic Parish. 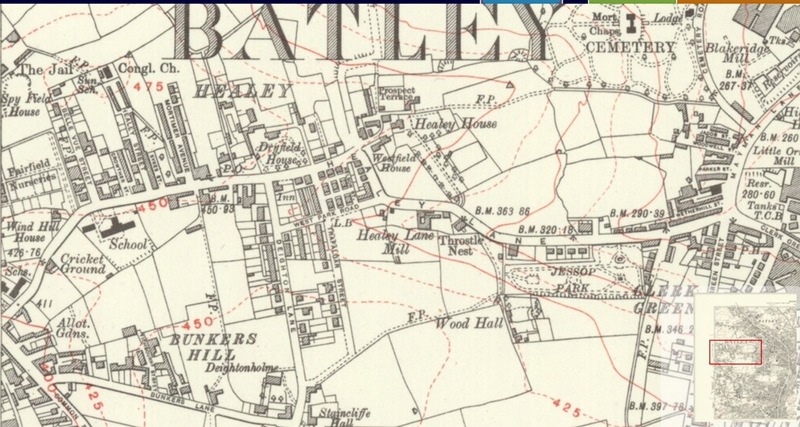 So I’m going to attempt a compromise, and focus on one area of Batley: Healey. 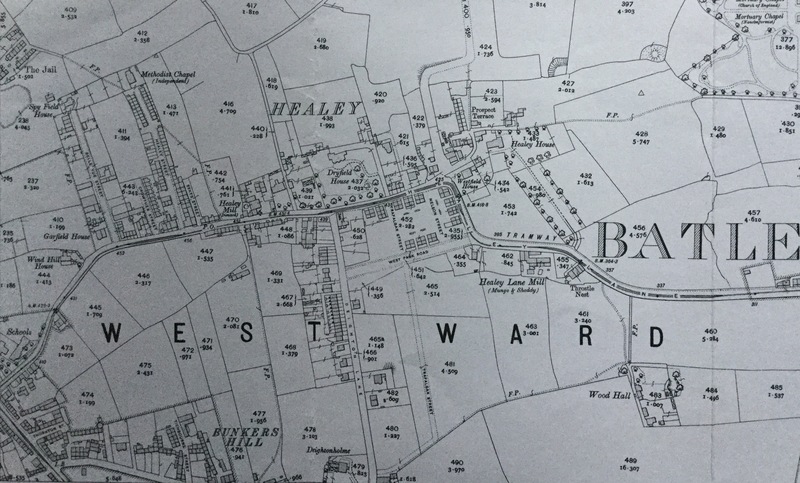 It doesn’t have a Batley St Mary’s WW1 connection, but it’s the area I grew up in. And it’s the one where I still live. It is also more manageable size-wise. However the deciding factor in my choice is one soldier in particular, whose record I accidentally stumbled upon. But more of that in another post. A couple of maps from 1905 and 1931 below pinpoint the area. 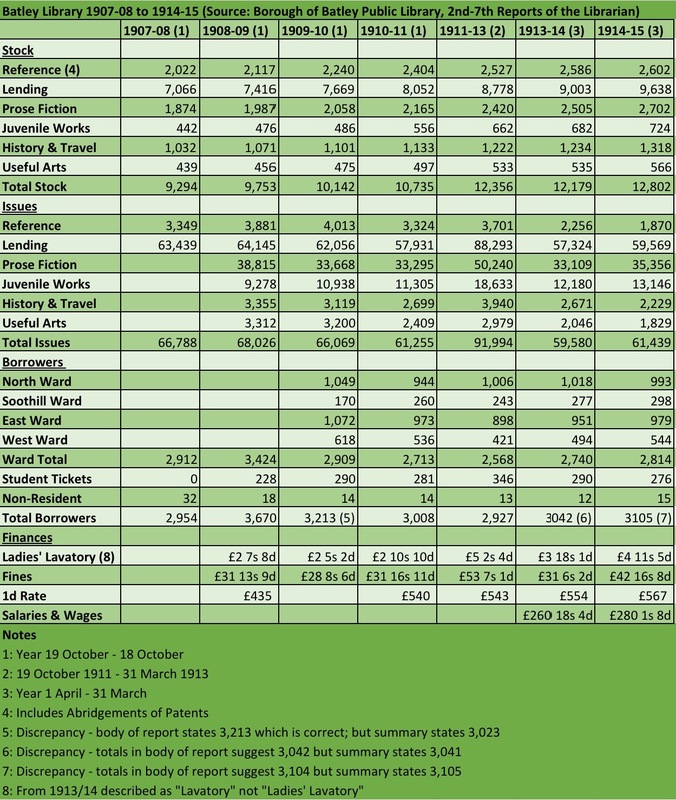 My initial analysis of these has produced the four Tables below. Over the next couple of years, till the centenary of Armistice Day, I intend doing a brief biography of each of these men. I also intend going through at least one of the newspapers to identify other Healey men. Although doing this will probably extend the length of time for the project. A case of playing it by ear. If anyone has any information about Healey men in WW1, it would be most welcome. It would also be lovely to extend this beyond Healey in WW1, to do a similar project for Healey in WW2. With the current centenary commemorations it is all too easy to overlook the sacrifices made by a more recent generation. So again names and information to kick-start this would be very much appreciated. I know I’m setting myself another potentially big but interesting task. Something a bit broader than War Memorial research, recognising the part the men across a community played.